A crime camera flashes at the corner of Broadway and Freret on Feb. 27, 2018. 250 new cameras will be installed in the city this year. ANNA KNAPP/The Maroon. 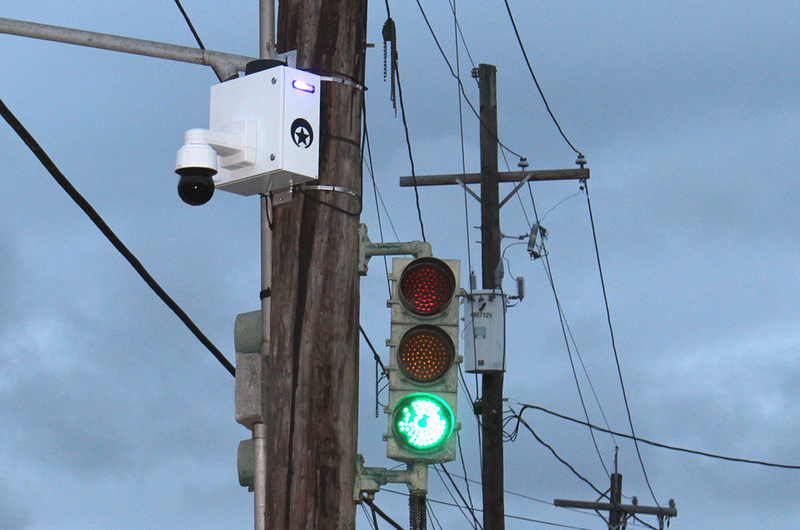 Flashing blue and red crime cameras have recently popped up on various corners of New Orleans streets. The city is in the process of installing 250 of these cameras, adding to the already thousands of cameras across the city. The cameras tie to the police’s real-time monitoring system. Madeline Reed, Crêpes à La Cart worker, walks home from work everyday. With a closing time past midnight, safety is her main concern. Reed said that she has taken precautionary measures when commuting. “I would carry a knife with me just in case something happened so now I feel a little more guarded,” Reed said. However, Ronal Serpas, professor of criminology and justice, says that research indicates that cameras do not stop all crimes. “Violent crime is usually a very personal event that is driven by emotion and heat of the moment and the cameras just really don’t have any impact on that at all,” he said. Serpas said that the cameras can impact some low-level drug dealing and quality-of-life crimes as well as auto-theft. Resident Zoey Cebulash is someone who benefits from the installation. “The camera is directly on my house, which definitely makes me feel safer that there’s a safety net just in case something did happen,” said Cebulash. The New Orleans City Council has delayed voting on the security plan ordinance. It includes an ordinance that would require business owners who sell alcohol to install a camera outside their business. These cameras would link into the police monitoring systems. The security cameras are estimated to cost the city $8.5 million as apart of their $40 million security plan to deter crime.